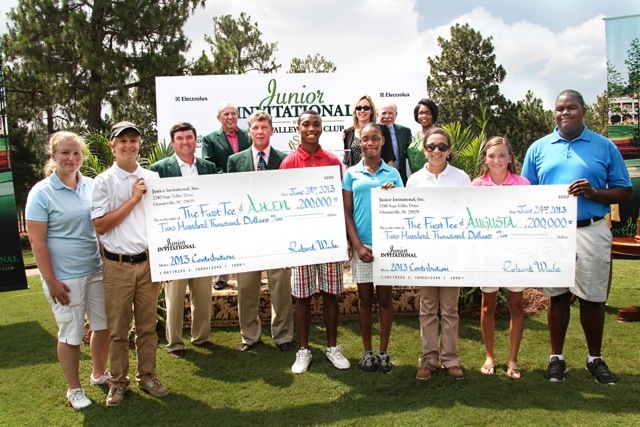 Graniteville, SC­ – June 24, 2013 – Checks totaling $400,000 were presented to The First Tee chapters of Aiken, South Carolina and Augusta, Georgia, today. 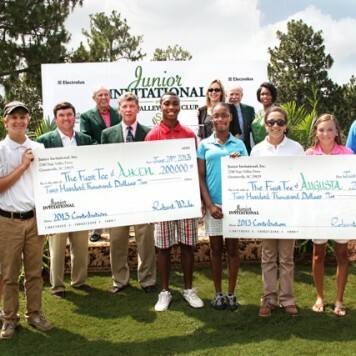 The funds were a donation from The Junior Invitational at Sage Valley presented by Electrolux. The Junior Invitational is recognized around the world by top junior golfers, their families and college golf coaches as “the major championship of junior golf”. Golfweek has named the Junior Invitational as the number one junior event in the world for three years running. This year, 18 international juniors from 11 countries joined with the top 36 players from the US to comprise the tournament field – “The TOP 54 Juniors in the World”. Carson Young was the 2013 winner, making a birdie on the final hole for the championship. Jack Nicklaus was the featured speaker for the Opening Banquet. The presenting sponsor, Electrolux was in attendance at today’s ceremony to present the checks to The First Tee chapters. Electrolux made an initial three-year commitment to sponsor the tournament in 2011 and this year extended the sponsorship another four years thorough 2017. Nike Golf, Norfolk-Southern and Gibbs International also generously supported the tournament. Our mission is to operate the most prestigious junior golf championship in the world—an invitation-only annual event for the top 54 players from around the globe, hosted by the renowned Sage Valley Golf Club. 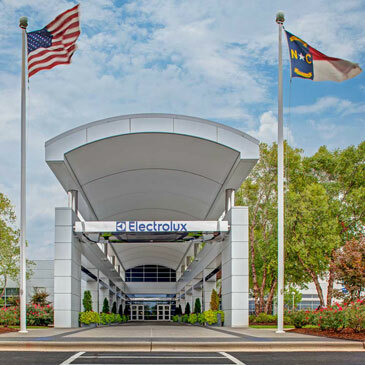 For over 90 years Electrolux has been committed to making your life better. By integrating simple, intuitive design with fresh innovations, we make appliances that fit perfectly into Your Home and Your Life. Nike Golf designs and markets golf equipment, apparel, balls, footwear, bags and accessories worldwide. It is passionately dedicated to ushering in the future of this great sport by developing ground-breaking innovations that enable and inspire athletes to become better. Norfolk Southern Corporation is a leading North American transportation provider. Its Norfolk Southern Railway Company subsidiary operates approximately 20,000 route miles in 22 states and the District of Columbia, serves every major container port in the eastern United States, and provides efficient connections to other rail carriers. Norfolk Southern operates the most extensive intermodal network in the East and is a major transporter of coal, automotive, and industrial products.